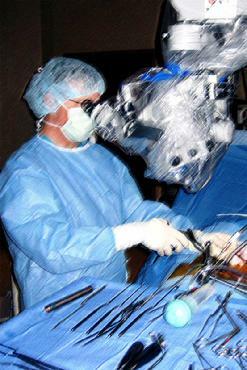 Dr. Ricca routinely performs minimally invasive endoscopic spine surgery. In 1991 Dr. Ricca moved to Jonesboro from Memphis Tennessee, where he had completed an accredited Neurosurgery residency at the Semmes-Murphey Clinic/University of Tennessee Medical Center. He joined the only neurosurgery group in town at the time and immediately began to develop a reputation for his excellent surgical skills and his compassionate care for his patients and their families. By 1995 he had completed all the requirements and examinations to qualify for Board Certification by the American Board of Neurological Surgeons. His continued Certification by the ABNS has designated him a Fellow of the American Association of Neurological Surgeons. In 1997 Dr. Ricca completed all the requirements, was evaluated for and elected as a Fellow of the American College of Surgeons. During this time in group practice, Dr. Ricca began what has been a series of firsts for Northeast Arkansas. He brought Stereotactic Brain Surgery to the area and was the first person in the state to perform Minimally Invasive Endoscopic Spine Surgery. Early in 2006, Dr. Ricca established Ricca Neurosurgical Clinic with the goal of providing outstanding neurosurgical care to patients in a friendly, customer service oriented environment. Using a team approach in the clinic setting, he and his staff developed a spinal surgery program for simple to complex spine disease. Some of his more common surgical procedures, when indicated, are: anterior cervical discectomy (and fusion) "ACDF", cervical laminoplasty, corpectomy, posterior lumbar discectomy interbody fusion "PLIF" with/without necessary materials, lumbar microdiscectomy, lumbar decompression. He also treats peripheral nerve diseases such as carpal tunnel syndrome. From 2012 to 2017 Dr. Ricca worked with Unity Health White County Medical Center and Searcy Medical Center to bring the highest level of surgical spine care to the central Arkansas area. In January 2018 Dr. Ricca returned to Jonesboro and joined the physicians of NEA Baptist Clinic. His philosophy of compassionate treatment and counseling of patients and their families continues. He is joining a great team of physicians, providers and staff members with the same goals, working toward the same approach - outstanding neurosurgical care for patients and their families in a customer service oriented environment. 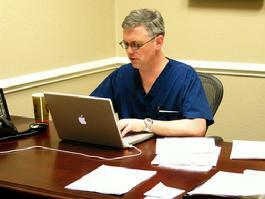 Over the years, Dr. Ricca's surgical emphasis progressed to involve primarily the spine, including complicated spinal fusion techniques. As spinal surgery research has developed newer and stronger materials and technologies, he has worked closely with a select few companies to not just become expert with their techniques but to also improve their systems. Most recently this has included working with spine surgeons in France and Italy to improve some of those new technologies and materials. As he has continued to expand his proficiency with these methods and procedures, he has also taught other spine surgeons these skills. Throughout his residency training and ever since, Dr. Ricca has enjoyed research and publishing. His published papers range from early neurology research to more recent articles on aviation and medicine. An early Bibliography list can be found here, while a more recent list of publications can be found here. 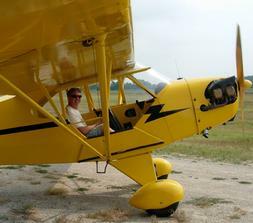 A 1940 J3 Cub is a favorite way to fly. In addition to practicing medicine, flying is one of Dr. Ricca's passions and he is an avid pilot. He is a certified flight instructor of both single and twin-engine aircraft and also has a seaplane rating. Dr. Ricca is a regular contributing author to the American Bonanza Society Magazine. He is a ground and flight instructor and writes educational material for the Beechcraft Pilot Proficiency Program (BPPP). Dr. Ricca serves as a special consultant in neurosurgery to the FAA (Federal Aviation Administration). Dr. Ricca is also a designated AME (Aviation Medical Examiner) with FAA. Most recently, he received certification to provide Class 1 Medical Certificates, is a service to the flying community that he is excited to be able to provide to the flying community by appointment through his office. Born and raised in Huntington, New York, Dr. Ricca received a B.A. in Chemistry from Kenyon College in Gambier, Ohio before attending and graduating from the Quillen College of Medicine at East Tennessee State University in Johnson City, Tennessee. It was during medical school that he met his wife, Dr. Dallie Fernando Ricca, also a medical student at the time. After medical school, they moved to Memphis for their residency training. The Riccas have 3 children, Aaron, Nathaniel and Rachel.